Diana drew this Picture...pretty huh! My name is Juan and I'm Spanish and I can write English well, but if we were speaking right now it would be a different story. I get frustrated when I speak to people because I sound like a robot and I loose track of the conversation sometimes. Expressions, phrasal verbs and slang really make it difficult to understand people and to sound natural too. I'm trying to figure out if there are some standard fluency strategies or tricks that are actually effective rather than just scams to get my money. There are a lot of eCourses on the internet claiming to help you "be bilingual in 7 days" or "speak like a native in a month" but those promises are just wrong. I guess I need to ask a question, so you can answer it don't I. :) What I would like to know is, how can I judge if a course is worth spending money on? What things should I look for specifically to help me speak better English? Or maybe am I wrong already...maybe a course isn't the answer. Could you give me some ideas on how I could improve my fluency alone? Thanks for your advice Robby. The common characteristics of nearly all foreign English speakers is that we can write so much better than we speak, we just need to reorganize and structure that knowledge in our brain so that we can speak fluently as well. To put it in other words - your general English knowledge is already sufficient to be fluent (otherwise you wouldn't be able to write as well as you do, right?) You just need to know the right techniques that would enable you to open up your true potential and produce natural and automatic speech. 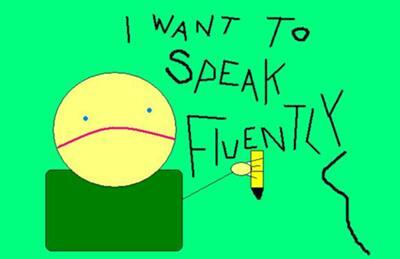 It's worth noting that we are the biggest enemies to ourselves when it comes to speaking fluent English. We inhibit our fluency by wrongly assuming that we need to incorporate ALL phrasal verbs and phrases and slang expressions in our speech and if something doesn't work out - it's the end of the world... It's when you have the overwhelming awareness in your mind of how much you DON'T KNOW and focus on that instead of speaking with vocabulary you already have. Also you have to bear in mind that much of vocabulary you use for writing is your passive vocabulary so you need to add it onto your ACTIVE one. How to do it best? First - when learning new vocabulary, always put new words in context and memorize the phrases by repeating a good number of times. Secondly - speak with others as often as you can about various topics. Thirdly - help yourself add more words to your active vocabulary by doing 20 - 30 minute long speaking sessions with yourself (especially if your real-life communication with others is quite limited). As for courses - my English Harmony System 2.0 is the only course I know that will help you reorganize and restructure your English knowledge so that you can start producing fluent speech with less hesitation and stuttering. You will or course learn some new vocabulary along the way, but the main point is to do with what you already HAVE and judging by the way you wrote your question your English is absolutely sufficient to speak fluently.